From the day, 33 years ago, when he was captured from his family, Tilikum’s life has been sheer misery, confined to concrete tanks and forced to perform in exchange for food. Three times he has exploded in rage, brutally killing someone. If, as now seems likely, his own sad life is coming to an end, it will not have been for nothing. More than any other of the whales in SeaWorld’s “collection,” he will be remembered as the one who set in motion the downfall of this evil company. SeaWorld announced today that Tilikum has a disease that is almost certainly going to be fatal. SeaWorld is trying to get out ahead of what is almost certainly going to be yet another in a series of miserable, and for them very embarrassing, deaths at its marine circuses over the last few months. Along with the announcement, SeaWorld has posted a video of veterinarian Dr. Scott Gearhart delivering the bad news, sandwiched between clips of smiling trainers feeding, caressing and playing with the captive killer whales as they talk about their good work. 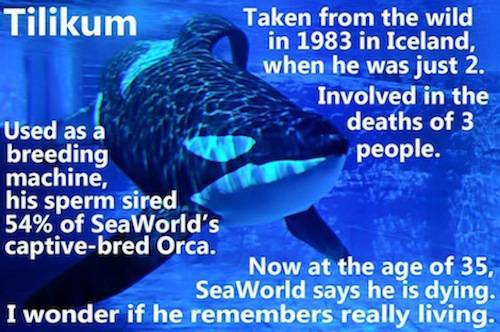 You might almost forget that this is no animal hospital nor sanctuary, but a multi-billion-dollar entertainment outfit, and that Tilikum is not a patient, nor, as SeaWorld likes to say, part of “our family.” He is, rather, their captive, and he once had a real family, thousands of miles away in the ocean near Iceland, until, as a baby, he was seized from his mother. “Tilly came from Sealand of the Pacific,” says Kelly Flaherty Clark, Director of Animal Training. “He definitely needed to put some weight.” As if to suggest they’d rescued him from this Canadian aquarium. Not so. His acquisition was a well-timed purchase of a valuable stud at a good price after he’d just killed one of the Sealand trainers. No mention of that by Ms. Clark; nor of the fact that Tilikum would go on to kill two more people, most famously and horrifically his trainer, Dawn Brancheau, in 2010. “The [issue] that is most concerning is that he does have what we believe to be a respiratory condition that is extremely difficult to treat. 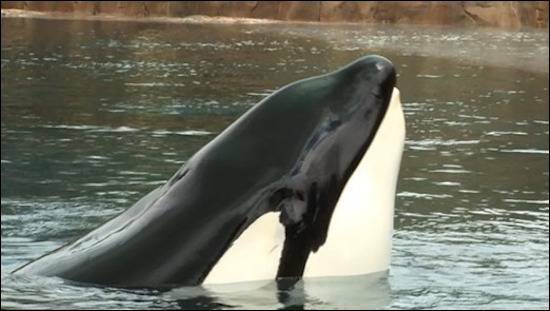 “The species that we found in Tilikum is a type of bacterium that is found in a variety of species including wild cetaceans. And for that he receives a number of medications on a daily basis. We use a variety of oral antibiotics and antifungals that the trainers painstakingly every day, several times a day, administer with the fish. If Tilikum would have shown up with this disease in the wild, there’s no doubt in my mind he’d have been gone a long time ago. Short of a miracle, things don’t look good for Tilikum. They don’t look good for SeaWorld, either. Since the documentary movie Blackfish came out in 2013, the audience has been shrinking and the company’s stock price has been plummeting. From the day, 33 years ago, when he was captured from his family, Tilikum’s life has been sheer misery, confined to concrete tanks and forced to perform in exchange for food. Three times he has exploded in rage, brutally killing someone. If, as now seems likely, his own sad life is coming to an end, it will not have been for nothing. More than any other of the whales in SeaWorld’s “collection”, he will be remembered as the one who set in motion the downfall of this evil company.